Of course all Vancouverites head down to Bellingham and Seattle for a one night getaway trip or shopping…but my main goal was to try The Cheesecake Factory. 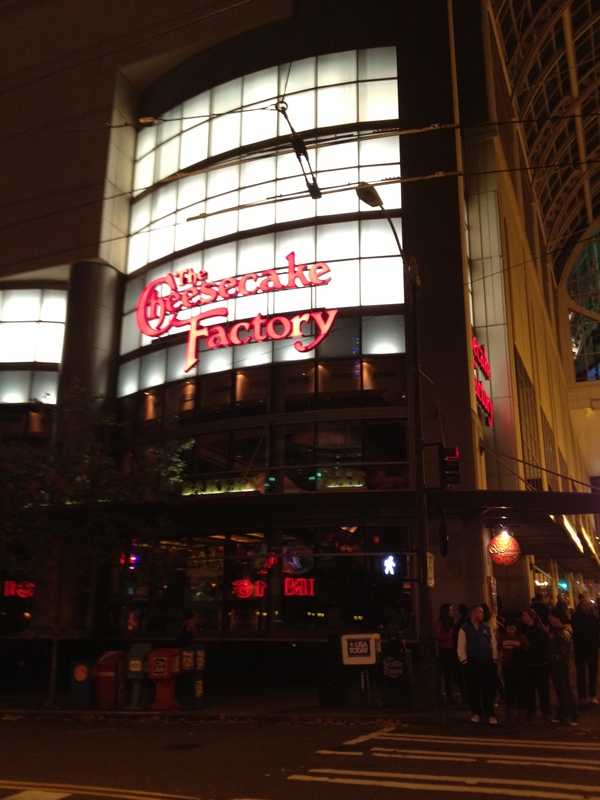 I have actually never been to the United States of America other than this trip to Seattle, so here’s a small round up of my experience at The Cheesecake Factory. Well the line up was one hour long and I was so hungry. Luckily since we were down town, I shopped around before eating and the wait was definitely so worth it. The restaurant was dimmed light, busy, and if there was music playing I definitely couldn’t hear it because people were just everywhere. My boyfriend got a small corner in the huge restaurant but there were enough servers to tend to us when we needed them. Apologies for not taking a picture of what my boyfriend ate, he was too hungry. 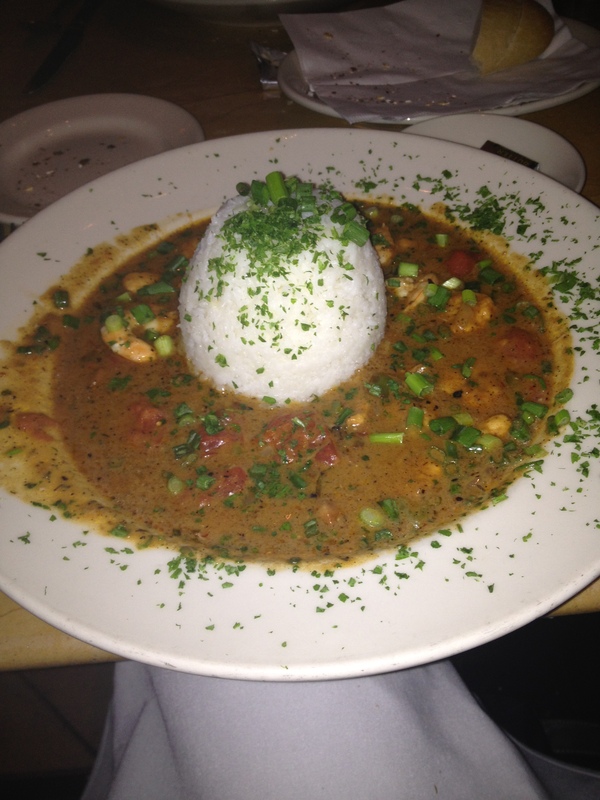 I ordered the “Shrimp and Chicken Gumbo” and my God did it smell wonderful when it was in front of me. The dish is cooked with shrimp, chicken, andouille sausage, tomatoes, peppers, onions and garlic simmered in a spicy cajun broth with cream and jasmine rice cupped on top. This was clearly too much sauce and too little rice, but the sauce was tomato-licious and full of spice. Cake is one of my Taboo words and always a craving of mine. This is the Oreo cheesecake and my goodness it had several Oreo halves inside – my stomach was telling me to eat more and stop at the same time because it was way too full. The cookie bottom complimented the middle cream and cheese section making it not so thick, and well the Oreos combined with it was just simply heavenly. 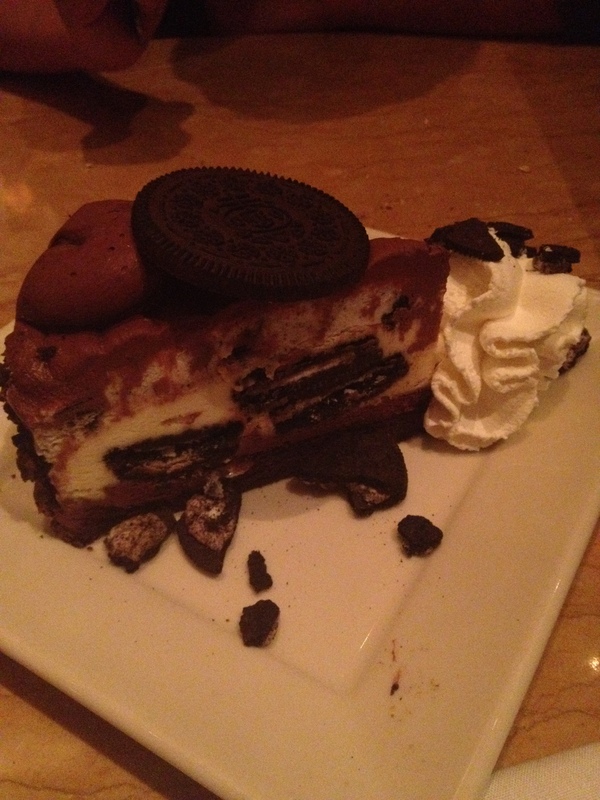 When I went to this restaurant, I only ordered a slice of Oreo cheesecake, which was a good call. So delicious and FILLING!